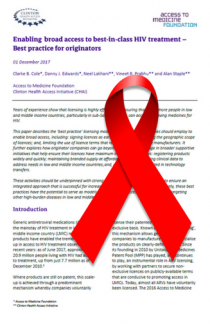 For World AIDS Day 2017, Clinton Health Access Initiative and the Access to Medicine Foundation have co-authored a paper describing best-practice licencing models that originator companies can employ to enable broad access to ARVs. The paper also explores a set of broader supportive activities that help ensure licences have maximum impact on access. Years of experience show that licensing is highly effective for ensuring that many more people in low- and middle-income countries, particularly in sub-Saharan Africa, can access life-saving medicines for HIV. 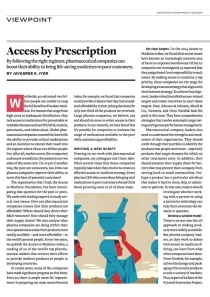 This paper describes the ‘best practice’ licensing models that originator companies should employ to enable broad access, including: signing licences as early as possible; broadening the geographic scope of licences; and, limiting the use of licence terms that restrict generic medicine manufacturers. It further explores how originator companies can go beyond licensing and engage in broader supportive initiatives that help ensure their licences have maximum impact. This includes: registering products widely and quickly; maintaining branded supply at affordable prices; generating clinical data to address needs in low and middle income countries; and, engaging when requested in technology transfers. These activities should be underpinned with strong governance structures for access to ensure an integrated approach that is successful for increasing access to HIV treatment. Importantly, these best practices have the potential to serve as models to also broaden access to key medicines targeting other high-burden diseases in low and middle income countries.